Joseph Shipp Bordwell was descended from a long line of patriots. The first of his ancestors to arrive in American was Robert Bordwell who left England and settled in Boston in 1670. Joseph’s parents, Herbert W. Bordwell and Minnie Ann (Shipp) came to Southern California, settling in 1887 in what would become Riverside County. H. W. was superintendent of the Palm Valley Land & Water Company in Palm Springs, sold real estate, managed the Reynolds Hotel on Main Street, and was one of the first five trustees of the Riverside municipal power company formed in 1896. He was elected public administrator for Riverside County in 1896. 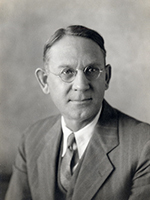 As a young man, Joseph worked for railroads in Southern California and Arizona; as auditor of the mining division for the Cananea Consolidated Copper Company in Sonora, Mexico; and as chief clerk for the American Smelting & Mining Company in Arizona. In 1913, Joseph returned to Riverside and joined the Southern Sierras Power Company where he held the positions of chief clerk, assistant auditor, and auditor. He was involved in many civic associations and was president of the Riverside County Chamber of Commerce, later called the Riverside County Board of Trade and was a member of Riverside’s planning commission.